For those of you new to Sidewalk Chalk, I've been keeping tabs on this season of "Mad Men" by finding the best of the Web's reviews, reactions and commentaries on the show. Call it a bit of an obsession of mine! No major spoilers revealed in this roundup, but of course if you click a link, you'll get more details. I'm still reeling from the events of last night's episode -- it really is a fruitless endeavor in trying to predict what will happen on this show. But this was a pretty fulfilling and refreshing season for me, and I cannot wait for Season 5. In addition, if you need to catch up on any episodes from this season, you can check out my previous link roundups. And of course, if you need some "Mad Men"-style fashion in your life, I'm hosting a vintage handbag giveaway here. See you next year, "Mad Men" lovers! - Recaps from WSJ, Television Without Pity, Tom & Lorenzo, Jezebel, Gawker, Slate, Vanity Fair, Washington Post,The Guardian, NY Daily News, NY Times, Seattle Times, IGN, NY Post. - Jessica Pare (Megan) is interviewed about Season 4 in AMC's Q&A this week. - Basket of Kisses has had some solid in-depth commentary all season long. Here they discuss Peggy's reaction to this episode's big news. And in reference to last week's episode, here are some posts about changing sartorial color choices, Pete's development in the series, how Don changes himself with women, the problems of addiction, who the movers and naysayers really are, and how Mona may be able to pick up some of Roger's pieces. - Celebuzz has some photos from the show's finale party. So many beautiful people! - WSJ has a blurb about how the finale has divided a ton of viewers. No kidding! - Here's John Slattery in his new Lincoln car commercial. Love the Roger-esque glasses! - LA Times talked to the cast about Season 4 during the finale party. 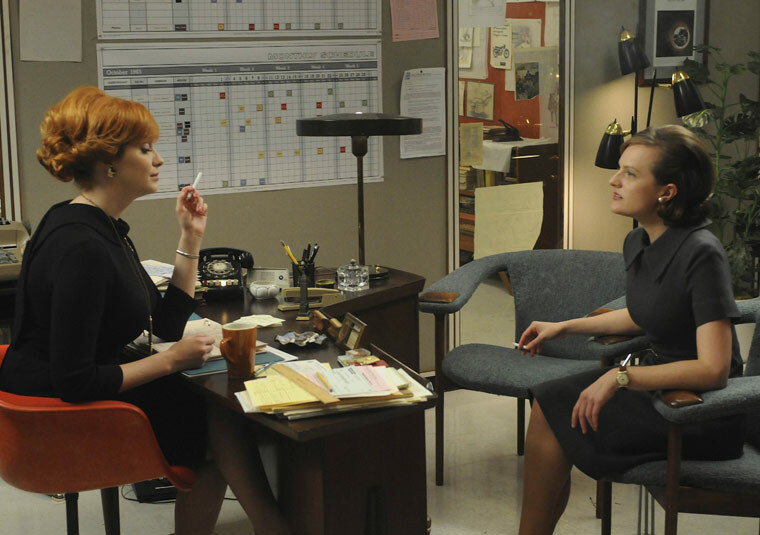 Learn more about what Elisabeth Moss thinks about Joan and Peggy's relationship, and what Christina Hendricks calls a "real doozie." - Vanity Fair indulges in some episode minutiae, ruminating on what band Megan would have likely seen at the Whiskey A-Go-Go. - NY Mag has an interesting interview with Rich Sommer, and what his character Harry Crane might have in common with "The Social Network." - In praise of Mad Style: Tom & Lorenzo have done an excellent job doing episode analyses of all our favorite characters' outfits. Looks like they're continuing their in-depth sartorial commentary in the off-season too! - Meet a real-life Peggy: NY Times has a neat story about a woman who worked in publishing in the 1960s. - The Baltimore Sun has a fantastic slideshow of photos on the set, specifically scenes that involve complicated spaces (closets, cars, etc). And finally, TWoP has a great slideshow roundup of the most outrageous moments in the history of the show. I haven't given in to the Mad Men phenomenon yet. Don't know how long I'll resist, though! I love Mad Men, but I'm watching the first season! I'm a little late! The twist left me absolutely shocked, and I'm still not sure if I approve. You're right that the scene with Peggy and Joan was one of the best of the season. I really like the autonomy that this season gave to both of those ladies' characters. Oh and don't get me started on the deception revealed at the end of the episode. Next season is going to be intense! I unfortunately have nothing to add about the show itself but I was thinking Miss J, Mad Men's biggest fan - perhaps we all can do a Mad Men inspired outfit post?